A pair of fused bones that make up the lower portion of the heads of creatures. Also known as the mandible, the lower jawbone hinges just under the cheekbone and is used to crush, pulverize, and masticate solid food. 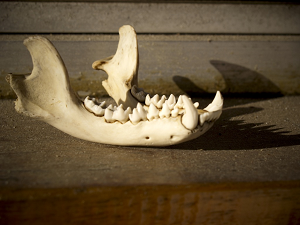 "Jawbone" by Tina Vance is licensed under CC BY-NC-ND.